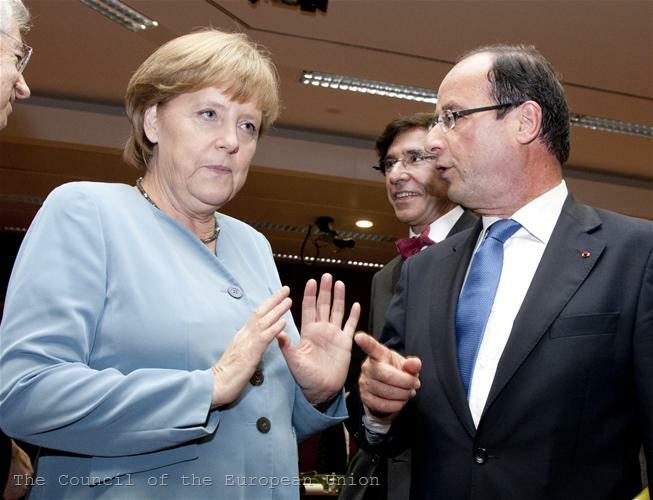 This is how we can explain simply the dispute that is going on at the highest political level in the European Union for some time. Disguised with complex phrases and masked with values and ideals, in fact this is a dispute about money. Because all are aware that dealing with the crisis demands money, lots of money, that those having it should give to others who are out of it. The question is under what conditions. Here we can clearly outline the two main positions in the dispute. The first one, let us call it the "German" position as it is most clearly articulated by Berlin, sounds like this: first guarantees that everyone will respect the rules and then (if they do) money comes, i.e. solidarity. Moreover, in return for reforms at national and European level. Part of those guaranties is transfer of sovereignty to a supranational centre to exercise control. For this reason, Germany (supported by several other countries) is unwilling even to hear of Eurobonds, which means pooling debt of the eurozone countries, nor of fiscal transfers from "healthy" to "sick" countries before it is certain that rules and control are in place. The second position, let us call it the “French” one as it gained momentum after the coming to power of Francois Hollande, is just the opposite: "There can be no transfer of sovereignty if there is no improvement in solidarity," i.e. money comes first (solidarity), then we'll see. In these words of the French president, a characteristic tinge of the French position sneaks – ceding national sovereignty is understood not as a precondition for further integration but only as a last resort and only when it comes to countries experiencing problems that request peer support. Berlin wants exactly the opposite - all to give some of their sovereignty up in advance in the name of common control, not later when the problem is already there. Francois Hollande alone has most accurately described differences in the positions of Paris and Berlin: "For now, Germany’s line of thinking is that Eurobonds, if I give the most optimistic version, could only be an end point, whereas for us they are a starting point.” The "French" position is understandably shared by countries hit by the crisis and even more understandably meets firm resistance in Germany. 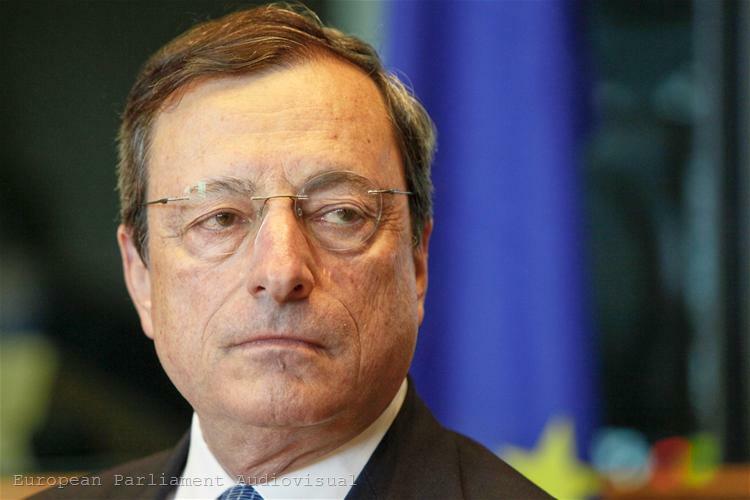 Berlin, however, finds solid support in the person of European Central Bank President Mario Draghi, who in recent months has been one of the most active participants in seeking solutions to solve the crisis. Mario Draghi is the godfather of the "Fiscal Compact" and the "Growth Compact" where European leaders declared their commitment to fiscal discipline and growth. If we had normal circumstances, the ECB would have monitored only the price stability and would not have to comment on the need for reform, for example, Mario Draghi admitted before the members of the Economic Committee in the European Parliament. But the situation is not normal, so it needs to be corrected: "Unsustainable imbalances provide the objective need for adjustment programmes – and the degree of the adjustment is directly related to the extent to which past policies were misguided." 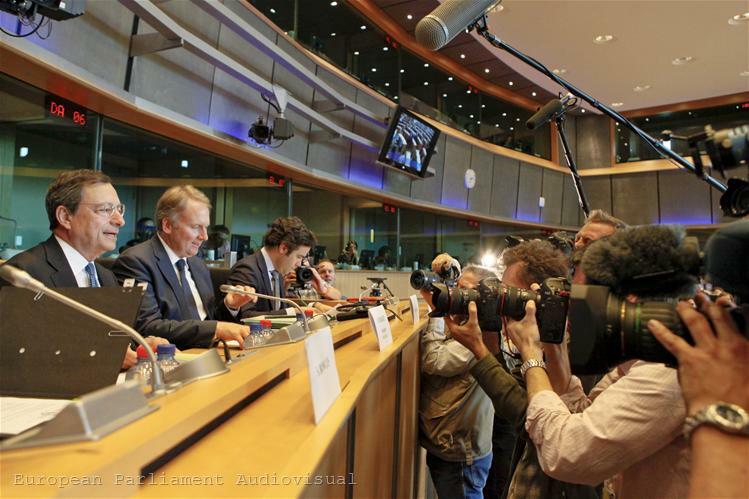 There is a solid core in the European Parliament that shares the "French" position – loosing fiscal targets and reforms, financial stimulus for the economy, the immediate establishment of Eurobonds. 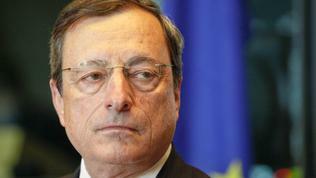 Mr Draghi, however, was adamant: "The fiscal union does not start from a transfer union, it is the arrival point." Somewhere out there, at the end of the process of integration we could see dimly the Eurobonds too and the common deposit guarantee scheme, because they include pooling of liabilities and this should be the end of the integration process. Which starts not with sharing of debt, but with sharing of sovereignty: "The sharing of national sovereignty at a supranational level is essential for the progress towards a fiscal union," Mario Draghi said. And the other important thing, the ECB president once again underlined, are the reforms: "Since financial assistance can only be temporary, the quality of the reforms and their implementation are absolutely essential. It is this quality that ultimately determines the success of a programme." And the quality depends on the ownership of the programmes by governments, parliaments and ultimately the citizens, so they to accept the programmes as their own and not imposed from outside, Mr Draghi explained. To that end politicians need to "communicate clearly about the economic rationale for adjustment." That means politicians to take responsibility for correcting the wrong policies, which in turn need the support of citizens. At European level, this means national leaders not to make statements contradicting the conclusions of the European Council, which they themselves have approved, Mario Draghi noted. The so called "German" position is now the official position of the European Union, as far as it is reflected in the report of European Council President Herman Van Rompuy "Towards a genuine Economic and Monetary Union", presented to the European Council on 28 and June 29. But there are alternative visions that are not to be underestimated because they reflect the views of influential political and economic groups. Along with Van Rompuy`s report, the influential think-tank Notre Europe, founded by former European Commission president Jacques Delors, presented the report "Completing the euro. 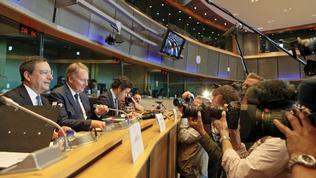 A roadmap towards fiscal union in Europe." The document is prepared by an analytical group named after Tommaso Padoa-Schioppa, the former Italian finance minister, who was also one of the founding fathers of the Economic and Monetary Union (EMU). We can judge about the paper`s ambitions also from the group members, who can be seen here. The authors start from the proposition that the large and sustainable heterogeneity of the EMU is the main reason for the current crisis, as the problem are the cyclical not the structural differences among the eurozone countries. To overcome these, or rather to compensate countries, the report proposes the establishment of a special "cyclical adjustment insurance fund" which to insure countries against economic downturns. "Countries would pay into the insurance fund in exceptionally good years (i.e. when the cyclical growth component is significantly larger than in the euro area average)" and receive from it in years of decline. In years of good business cycle the countries would pay a "standard amount", but "disproportionately more when starting to overheat." Money from the fund can serve as “buffers” in a downturn by facilitating "downward real-wage adjustments or alleviate the pressure on domestic unemployment insurance schemes in a severe downturn and thus reduce pressure on public finances." The authors argue that there will be no permanent transfers in one direction only and the countries will continuously move from the group of payers to the group of recipients and vice versa. The fund must be outside the EU budget, financed by the national states and managed by representatives of the national finance ministries under the control of the national parliaments. There should be clear access criteria and strict limits to the amounts that a country can take. Furthermore, the report states the need for "rebalancing fiscal rights and fiscal duties in the common currency area, in particular through the creation of a European Debt Agency (EDA)." EDA would be less than a fully-fledged finance ministry or a treasury but more than a simple European Monetary Fund providing emergency assistance against strict conditionality, the authors write. 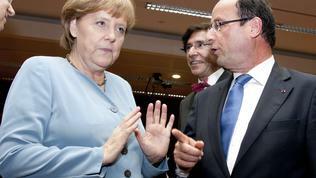 The agency must be jointly and severally guaranteed by all euro area countries. Any country may issue debt amounting to 10% of its GDP through the EDA as the rate would be the same for all euro area countries. If they need to issue more debt, countries can use the EDA but under increasingly stringent terms and higher interest rate, while accepting for every additional amount a stepwise transfer of elements of their fiscal sovereignty to the EDA. The agency would be headed by a “Euro Area Finance Minister” under appropriate democratic control involving the national parliaments and the European Parliament. "We argue that EMU countries should become subjected to much stricter budgetary surveillance and at the same time be willing to give up elements of their sovereignty when they are cut off from the market (“sovereignty ends when solvency ends”). At the same time, however, there would be an EMU level guarantee to assume responsibility on providing adequately-priced access to sovereign bond markets in the context of the creation of a European Debt Agency." As shown, the logic of the report is the opposite of that in Herman Van Rompuy's report - the focus is on fiscal transfers and common debt issuance, while the transfer of sovereignty is minimised and is subject to guaranteed solidarity. The authors work with the assumption of "as much fiscal federalism as necessary for the appropriate functioning of the euro, but as little as possible." They emphasise that it is important to maintain "strong domestic political cultures" while building a strongly-integrated economic framework to allow the European level to become an economic actor on its own. "What needs to emerge is a sui generis construct that can solve the economic challenges while preserving strong democratically-legitimate foundations." At first sight, these proposals raise some reasonable questions such as who will pay in the cyclical insurance fund, given the forecasts of sluggish growth in the euro area? And how can we guarantee that the same "growing" countries will not finance always the same "decreasing" countries? Or why these "strong domestic political cultures", that the authors seem so keen to preserve, have not imposed in time prudent fiscal and economic policies? At this stage the question of which comes first - discipline or solidarity - sounds like that of the chicken or the egg. However, what is really important is that they to go together because discipline ensures that solidarity will not be abused. Which is not difficult to assume, given that, as I said, it's all about money.